In General: All shows are held 3 times a year, in February, April, and October. All shows are held in the 3 and 1/2 acre "Cow Palace." Directions and Map: Click this printer friendly directions and map link to see fairgrounds and building locations. 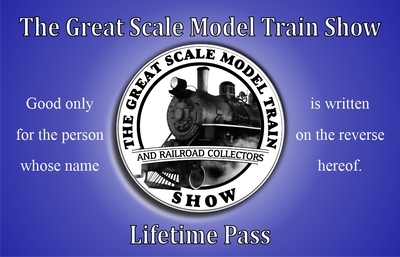 Lodging: The best value we've found is the Holiday Inn Express, the "Official Hotel" of the Great Scale Model Train Shows, about 8-10 minutes from the show. Click the image in the left panel for details and reservation information. Admission Prices: No better value, anywhere! credit/debit cards for admission to the show. LIFE-TIME PASS! Are you a "Frequent Flyer?" Consider a life-time pass for yourself or as a gift! Pricing is just $125 per pass, or $100 each for 2 or more. Just complete and send the information below. When you pay the invoice we send back to you, we'll drop your pass(es) in the mail. Please note that these are in limited supply, so don't miss out! Please note: Each card has a signature panel on the reverse, and may be used only by the person named on the signature panel.